How can I get copies of local or statewide laws? How does a bill become a law in the Alabama Legislature? How can I keep up with the progress and status of a Bill that has been introduced in the legislature? To check the status of a bill visit the Alabama Legislative Information System Online (ALISON) at http://alisondb.legislature.state.al.us/acas/ACASLoginIE.asp. On the home page click on “Bills”, then select “Status”, fill in the bill number (such as SB23 or HB14) and click on “Get Status”. The screen indicates the location of the bill in the Senate (S) or House (H), the current status of the bill and the last date of action on the bill. Where can I find the voting record of individual legislators? Go to http://alisondb.legislature.state.al.us/acas/ACASLoginIE.asp?SESSION=1058 Establish which Session (if other than the current or most recent). Then click on “Bill Status”, identify the Bill you are looking for, then click on the Bill Number (i.e. SB4) and then “History”. A page will open that shows all the activity on this particular piece of legislation. You must identify the appropriate Roll Call Vote (remember that a bill may have many votes before it is finally passed). Click on the Roll Call Number to see the recorded vote. Can I listen to the Legislature when they are in Session? What should my son/daughter do if they want to be a Page in the Alabama State Legislature? Does my legislator read my letters and e-mails? Yes. Legislators like to hear from the people they are elected to represent. Large volumes of letters and e-mail sometimes make it difficult to respond to every comment they receive, but they take note of each comment and opinion. How can I speak with my legislator by phone or meet with them about a specific issue? You may call the Marshall County Legislative Office at 256-582-0619 and leave a telephone message if the legislator is not available or to request an appointment. Or, you may go to the “Contact us” e-mail link on the MCLO Homepage. How can I schedule a member of the Legislative Delegation to speak to my organization? Simply call the Marshall County Legislative Office at 256-582-0619 to extend an invitation or get your event on the legislator’s schedule. Will my Representative or Senator write a support letter to assist with a grant application or other efforts for a local project? In most cases, the legislators are happy to lend their support to local projects and program efforts. Contact the office as early as possible and provide sufficient information regarding the project or application. What are the qualifications to run for state senator or state representative? Under Article IV, Section 47, of the Alabama Constitution, Senators must be at least 25 years of age at the time of their election, must be citizens and residents of the State of Alabama for at least 3 years, and residents of their district at least one year, prior to election. Members of the House must be 21 at the time of their election, and must have been citizens of Alabama for three years, having lived in their respective districts for at least one year immediately preceding their election. Can you help arrange a tour of the Alabama State Capitol or other attractions in Montgomery? Yes, we can provide information regarding tours, travel, lodging, area attractions and helpful websites. We can also help you plan an itinerary and make reservations. Can you assist me with contact information for local, state and federal offices? Yes, we can provide referrals and/or contact information for various government offices and agencies. If I am having problems with services from a local or state agency, how can your office help? The Marshall County Legislative Office performs a variety of research and investigative tasks for legislators and constituents as well. Work may include contact with private organizations, federal, state and local government agencies as appropriate. You may register at the Board of Registrars Office in the Marshall County Courthouse located at Blount Avenue in Guntersville or you may download the voter registration form at http://www.sos.state.al.us/downloads/election/vr/nvra-2.pdf . This form may be mailed or hand-delivered to the Board of Registrars. Be advised that voter registration is closed the 10 days prior to an election. Can you help me track the status of my State of Alabama income tax refund? Where can I find county statistical information and demographics? There are a number of places where county information can be found. Depending on what you are looking for, you might try the websites for (1) Marshall County Economic Development Council (2) Marshall County Commission (3) Alabama Department of Education, or (4) U.S. Census Bureau - and other found under “Resources” on the MCLO Homepage. Where can I find Alabama voter information? Visit the Alabama's Secretary of State's website at http://www.sos.state.al.us/downloads/election/2012/2012VoterGuide.pdf for complete voter information. You may also download a voter registration form at http://www.sos.state.al.us/downloads/election/vr/nvra-2.pdf which can be mailed or hand-delivered to the Board of Registrars Office in the Marshall County Courthouse located on Blount Avenue in Guntersville. Be advised that voter registration closes 10 days prior to an election. What are the dates of the Primary and General Elections for 2012? IMPORTANT DATES FOR ELECTION 2012 PRIMARY ELECTION - MARCH 13, 2012 March 2 Voter registration on deadline. March 8 Last day for voter to make application on for an absentee ballot. March 12 Last day for voter to hand-deliver or postmark an absentee ballot. PRIMARY RUNOFF ELECTION (IF NECESSARY) - APRIL 24, 2012 April 13 Voter registration on deadline. 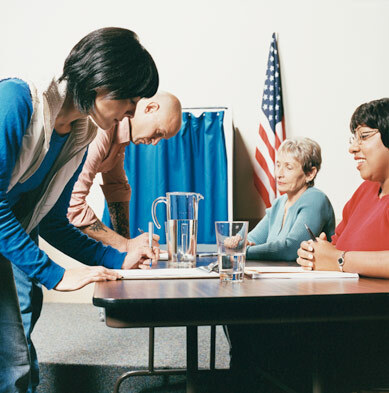 April 19 Last day for voter to make application on for an absentee ballot. April 23 Last day for voter to hand-deliver or postmark an absentee ballot. GENERAL ELECTION - NOVEMBER 6, 2012 October 26 Voter registration on deadline. November 1 Last day for voter to make application on for an absentee ballot. November 5 Last day for voter to hand-deliver or postmark an absentee ballot.